My bubbles always used to fall off the track. In fact there was only one bubble wagon, an MIR one, and it only fell off at the common crossing of a Peco large radius curved point at the entrance to my station. At the time, all I knew about finescale standards was that some Peco points were called finescale and some were called universal. I didn't know you couldn't run finescale wheels through universal crossings. I had read loads of back issues of Railway Modeller, and was aiming for a realistic, modern image, CIE layout, but every time that little bubble wagon hit the crossing, it derailed. I was stumped. Before I could resolve the problem, college and life intevened, the railway got put into the attic, and here I am, 25 years on, finally getting back to some modelling. The problem, it turned out, was incompatible wheel and track standards. The bubble wagon had Alan Gibson's finescale 00 wheels, which have narrow flanges and tyres, while the track was coarse scale to allow the steamroller tyres and flanges of old Triang equipment to pass through. To solve the problem, and make sure I didn't have it again, I had to settle on one set of track and wheel standards. At the same time, I was unhappy with 00 as a scale-gauge combination. It's not so much the track itself, although at 4.5 mm under-scale, it's closer to the Tralee and Dingle than the Tralee to Dublin. It's more because the 6 foot way between the tracks has to be increased to compensate, so that instead of having two tracks and a six-foot of 21:24:21 mm, you end up with 16.5:30.5:16.5 mm. That leaves the gap between the tracks almost twice as big as the gauge, rather than being nearly the same size, and it was something that bothered me. The choice then was whether to go for 21mm gauge and 4mm scale, or try some other combination. I thought about 1:100 (approx 3mm scale) which would give a gauge of 16mm, for which I felt I could use 16.5mm track; but the track would then be 33% overscale, even if I used finescale 00. More significantly, so would the wheels. It seemed easier just to use 4mm scale, and rely on all the support available in terms of finescale products in that scale. I thought about 2mm finescale as well, but felt the models would be just too small for me to make accurately – and I'm short sighted enough already. In the meantime, I had seen Adavoyle at the SDMRC show, and had spoken to Tony Miles, and that really sealed my choice. So I finally made a start last September (having sworn I wouldn't read Irish Railmway Modeller in the meantime, so as to stop me wasting time) and, at a snail's pace, I've produced four pieces of track and one set of (almost functional) points since then. I've now moved on to producing a 1.2 m section of double track with a B6 crossover. It's slow work – at this rate, Irish Rail will have the DART interconnector before I have a layout – but I'm figuring everything out from scratch as I go, even the basics of soldering and drilling holes in pointwork sleepering. I'm also getting a bit quicker as I repeat basic processes. So what's this got to do with the GSWR? Well, after reviewing all the books I could find, I wanted to build a model set at a time when the railways were in an optimistic mood, with a decent level of service. I initially thought of CIE about 1950, but I preferred the look of the locos before they were rebuilt, reboilered, superheated and all, and GSR battleship grey was a bit of a turnoff too. I feel Adavoyle really 'nailed' the Great Northern, and I didn't want to just produce a pale imitation. I prefer tender engines to tank engines (that one goes back a long way – Edward, not Thomas), so the CBSCR was out. Service level on the WLWR and MGWR seemed lower than I wanted. The Midland stations were very long and very narrow, so not great for a limited space. So the GSWR about 1910 was what I decided to aim for. That will inevitably require one or more of Mr McDonnell's little 0-6-0s, hence the title for this thread. I want to stress that I am NOT trying to restart any gauge / standards debate. (There's enough discussion about that on other threads here.) There's an awful lot to be said for just switching the controllers up to max and sitting back lineside and watching the trains roll by: it's probably what got most of us interested in model railways in the first place. Also, compromising on gauge leaves a lot more time for working on other aspect of realism, and some of the work on this site is superb. Sometimes I wonder if I'm mad to try this; but what the hell. Thanks, by the way, to Gerry Byrne for encouraging me to start (though he didn't know quite what I had in mind) and to John Mayne (whose path I must have crossed many times in George Hannon's model shop in Malahide in the 70s) whose posts on this site helped make the start a bit clearer. I'll post some pictures below of what I've been up to, and show some of the failures along the way. Now to see if I can add some pictures. 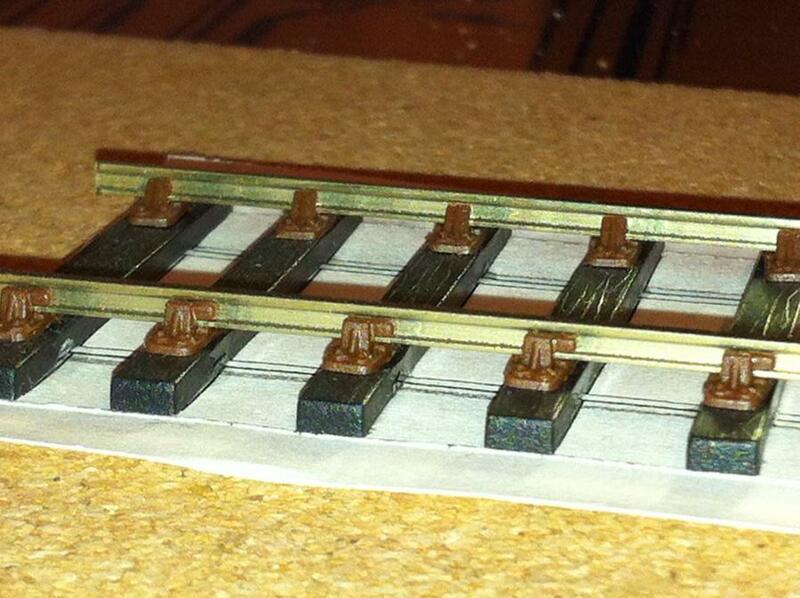 These are my first two pieces of 21mm track, alongside the Peco point that caused the problem in the first place. The difference in gauge is readily apparent when the two tracks are side by side, without ballast. One rail is ply and rivet construction, the other is C&L plastic sleepers and chairs. The C&L looks much more realistic with the chairs holding the bullhead rail, and is much easier to build, but I'm sticking with ply and rivet for practice for now: it's cheaper; it'll improve my soldering; and I'm only building stuff I won't use in a layout for now, until I know what I'm doing. I was surprised how little bullhead rail there was in Ireland before the late 30s – really just the GSWR main line and the GNR. The Midland used heavy section flat-bottom, and sidings were almost invariably light flat-bottom rail. The DSER wasn't relaid until the late 30s or so, judging from pictures. I laid the rails directly onto a Scalefour Society template. The GSWR laid the Rosslare – Waterford line with 45ft sections in 1906, so I'm taking it that 45ft lengths are about right. Mind you, I can't decide which English company's template to use, and they have quite different sleeper separation for the same length. I also don't know yet if they used 45 ft lengths on the Cork line which could have been relaid earlier, so I've some more research to do. Some problems with soldering. Going back to my old metalwork teacher's instructions, first you clean the joint, then you flux the joint, then you apply solder to both sides, then you sweat the pieces together until the solder melts. Problems I encountered were: not cleaning the joint properly and not using enough flux, so that the joint fails; and putting on too big a blob of solder, so that the rail does not sit down properly and letting the solder harden without pushing the track down into it, thereby leaving the rail too high to make the next joint. 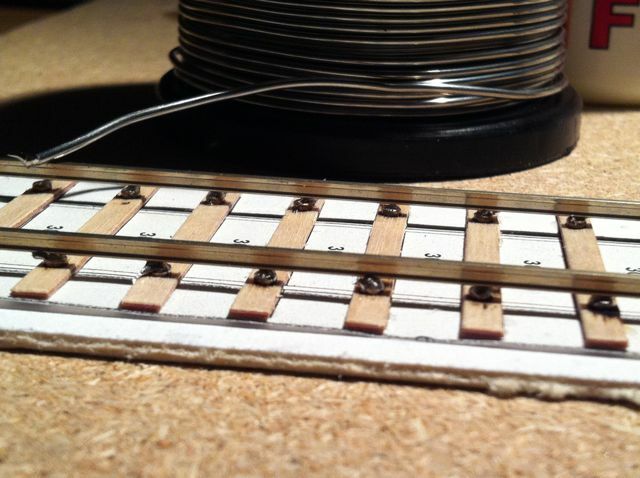 Result – with a loose sub-base you get level track but unlevel sleepers. The moment you try to put it down on a flat surface, all the inconsistencies become apparent, and the poorly fluxed or cleaned joints start to fail. Keep at it and in a few weeks when you get your mojo working you will fly through it. I exclusively use chairs from P4 Track Co as they produce all the special chairs for point work that C&L don't. Once you start getting the soldering right you can cut the chairs in half and fit them cosmetically to the sleepers. I use Templot myself and although it can be difficult at first to get your head around it once the light switch goes on you will be fine. I gave up using ply and rivet construction a few years ago and now I exclusively use P4 Track Co chairs bonded to the wooden sleepers with butanone and they are solid once bonded. It might be a good idea to stain the sleepers before you start building the track as it is harder to do it when the rail and chairs are there. There is no doubt that once you see the converted rolling stock running on 21mm track it just looks right. It also makes you up your game concerning the scenic side of things and the architecture. I think you are doing great work and I can't wait to see more, excellent . 21mm isn't my cup of tea but I just love reading your posts and looking at your photos. Looking forward to your future updates on this thread. As Rich will tell you I'm one of the guys who likes to sit back and watch the trains roll by. I wish I had the time mate and the space. I am hoping to get the man shed started soon and once that is finished (hopefully before the winter) I will start building the track. When I design the template for the layout I will print it and piece it together and lay it out on the baseboards. That way you can begin to lay the sleepers in situ. I thread all the chairs onto the rail and bond them to the sleepers as I go along as this way it gives the track a more prototypical flow. A lot of people are happy to use copper clad sleepers and flat bottom rail and I will use that system myself for the off scenic areas. Planning and executing a 21mm layout takes a lot of time and patience to get it right, but that is one side of the layout build that I love. 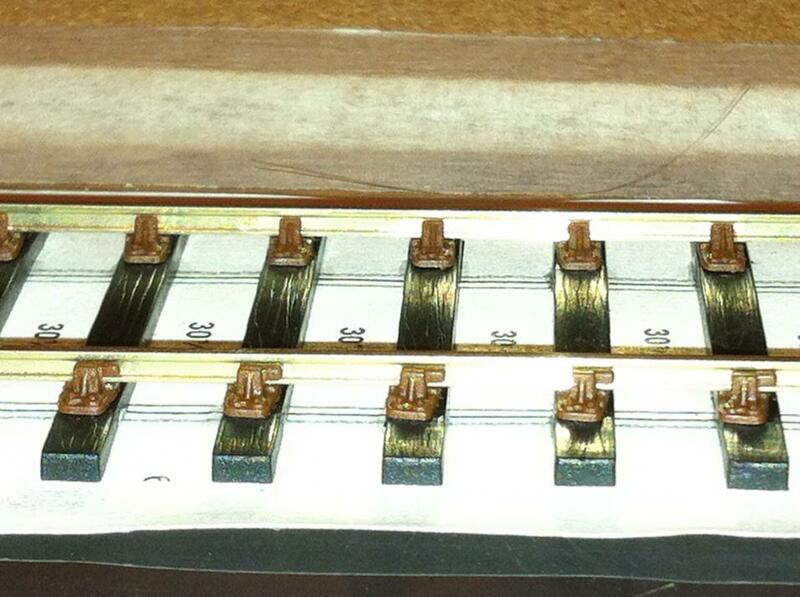 I am waiting on a jig for filing the C & D type vees and crossings as they are in short supply at the moment. I also need to get some axles, wheels, and bogie subframes as well some some axles and wheels for converting the locos, the 201's should be interesting. I should have some free time in a few weeks and I will be building some plain track and a B8 point for testing locos and rolling stock and I will take pics and post them as I am building it. I know that a lot of people say that they are just happy to watch trains go by and the OP has mentioned that also. The thing is, is that you can still do that with 21mm track. My own preference is to have the track look the correct gauge. Different people use dcc sound as a way of getting closer to the prototype and I think that the final outlay for sound chipping loco's is far more expensive than converting rolling stock to the correct gauge, mind you I might add sound to some locos in the future as I do find it does add a different aspect to a layout. The most important thing for me in railway modelling is that it must keep you interested, focused, and it must never get boring. Building my own track fulfills all those needs for me. I think that the track gauge is a little less obvious if you are modelling BR and there are some great UK layouts that use 16.5 track and they are fabulous layouts, Widnes Vineyard is one example. 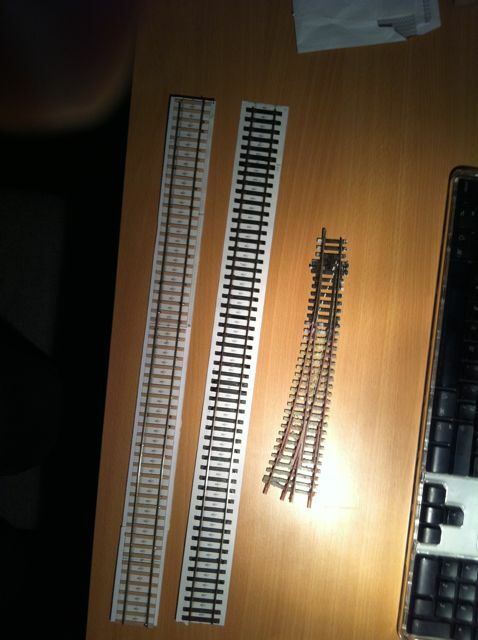 Anyone can begin to start building and laying 21mm track with all the bits and pieces that are available from the trade. If you don't fancy filing switch blades or building common crossings, all these are available to buy from C&L Finescale. I think that time and space as John Mayne has suggested in another thread are the main limitations for most people modelling the correct gauge. There are some lovely little stations on the network like Carrick On Suir, Thomastown, Muine Bheag, Cashel, to name but a few that could fit into the spaces that the majority of us would have available for building a layout to 21mm. Thomastown was one station that I considered as a possibility as a layout set in the early to mid naughties. You could have MK111, MK11, Cravens, a s**tload of freight including Beet trains, as they were re-routed over that line after the Cahir Viaduct collapsed. I also thought that the beautiful viaduct on the Waterford side of the station would have made a stunning addition to the layout, but Clonmel won me over as I just love the Station building and I feel it is one of the finest pieces of Architecture in the country. I have the vision and when time and space are available I will have the fun. Alan, wonderful preamble and great strategy. I'm looking forward to the more simple developments like track construction in this thread. I have a small Quayside layout in the works, which would be 21mm, only for the cost and unknown of regauging stock, so I'm in total admiration. I'm not so sure C&L sleeper spacing looks very Irish, but I might be getting OTT! Rich seems to be and endless source of info on 21mm so get him to spill plenty beans! One thing I should have added is that I will be using DCC to operate the layout so I will use brass lace makers pins 25 or 28mm. I will file down the heads to fit under the bottom of the bullhead rail, solder them to the rail every 24th sleeper and push them through a pre drilled hole in the sleeper and through the baseboard. The droppers for the bus can then be soldered to the protruding lace makers pin. A chair cut in half can be used cosmetically to hide the soldered pin. In theory it should work so fingers crossed. 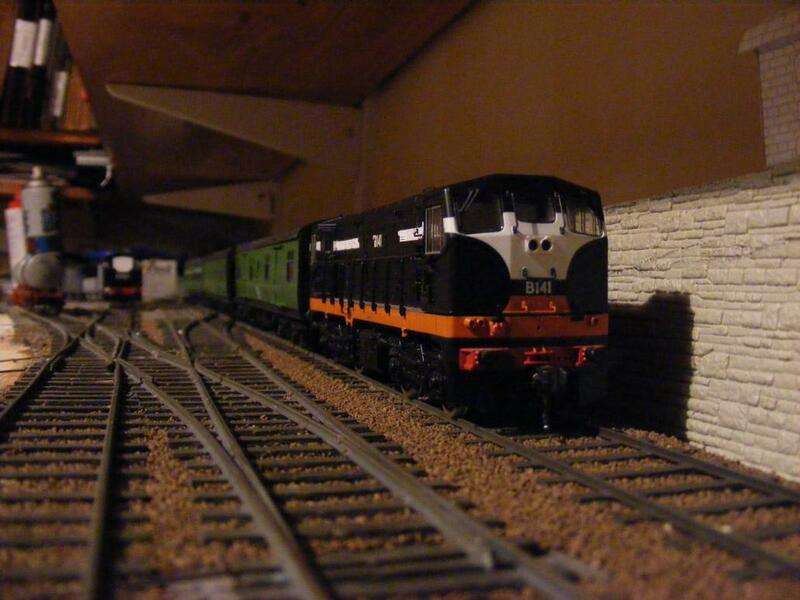 Good to see another modeller having a go and pre-amalgamation too, Paul Greene the former owner of SSM models the GSWR in S Scale and has built a model based on Killorglin complete with green J15. I started work on a small urban shunting layout based on the Liffey Branch to get something running while I eventually sort out space for a larger layout, however I need to carry out some major adjustments to the trackwork as I left clearances too tight with carriages side swiping on curves. Iain Rice had good ideas about modelling bits of stations, loco depots or goods yards rather than a spralling country station, there are even a few plans which morphed out of Westport Quay . Thanks for the encouraging words and the warm welcome, and keep the advice coming. Rich, I'm planning on moving on to the P4 track company's sleepers for the reasons you mention – plywood sleepers and accurate chairs for all the pointwork being the main ones. I decided to stick with ply and rivet for the moment though, because I want to be improve my soldering before I tackle any brass kits. I've a particular way I want to do the painting, which is why I didn't stain them in advance, though I read your piece on staining and Iain Rice's passage on the subject in An Approach to Finescale Trackwork before I started. I take your and John's point about the gorgeous little stations on the network, though when I started looking at them, most would scale out over 3m. The shortest ones seemed to be on the Burma Road, but train service was a bit basic. I'm wondering about letting the GSWR take over the Bandon a few years early, and running a J15 onto Baltimore or Bantry quay. The idea of a quayside layout really attracts me: one of the best pieces of railway writing I ever read was Iain Rice's “Tregarrick Regained” in the 1980 or 81 Model Railways. I'd no idea, John, that some of his plans originated in Westport Quay. I looked at it, but the problem was that the line didn't run down onto the quay at all, so I couldn't put the trains and water together without changing things around. Newport's a lovely station, with a viaduct straight out of a tunnel and straight into a station. How often do you find that in reality? But the service pattern is quite light. I think if I wanted a layout with mountains and sea, I'd go for the Valentia branch. Anyway, that's all for the future, I have to try to keep focused on improving my skills for the moment. Anthony, I'm a big fan of your Irish Rail stock, and with your videos on the site, I even get to be the one sitting and watching it go by. Fantastic stuff. I think the ultimate tail-chasing 00 layout at the moment has to be Peterborough North on RMweb – I wasted a whole load of time reading that thread. John, I'm taking your point about the small test track. That's where the 1.2m of double track with crossover that I'm working on at the moment comes in. I plan to build a second one the same length, and figure out baseboard joints, and use them as a shunting plank and a test bed for some scenic work. I love your little Liffey branch. I've been looking at Paul Greene's Killorglin on the S scale society website. It's the only clue I have to what the GSWR's green loco livery and its purple lake carriage livery were like. Am I right in thinking that no. 36 in Kent Station is in CIE lined green rather than its original livery? Or that 186 and 184 were painted in GSWR colours during the shooting of The First Great Train Robbery? Richie, thanks for the encouragement. I've just been looking at your buildings thread. That's a superb standard of work. I might ask you some questions about it when I get that far. I'll move on to points next. Alan that beautiful picture truly illustrates the need to buy a Templot license as you could not create that as a scale model with proprietary off the shelf track. Peterborough North is a smashing model Alan and it shows how hand built track even built to 00 16.5 can look stunning. Jim Smith Wrights Birmingham New Street is a work of pure genius, the track, the buildings, the rolling stock. Adavoyle, Loughrea, and the excellent layout that John Mayne is building are the real inspiration for me at the moment and your work is amazing for someone who is only beginning their journey in the realm of 21mm. Your enthusiasm for the work ahead is palpable, I can't wait to see more. BR 70's themed, albeit in EM. Still has some beautiful trackwork though, not to mention some stunning modelling in general. Great link Fran, that is some exceptional modelling. Peter Johnsons original Canada Road inspired me to have a go at an urban Irish layout, you can squeeze a lot more in if you dont have to make room for a passenger station. I was a fan of Eastwell the East Midlands Ironstone layout and my first successful use of handlaid points and track was on an 8'x1'6" self contained EM Gauge mineral line based on Iain Rices Bankfoot design capable of keeping an operator busy for hours positioning wagons for loading and making up trains. The 21mm layout is in stasis at the moment I dropped a real clanger in allowing the minimum 6' clearance between running lines on the dock layout with coaches side swiping on curves, I need to do a re-design open up clearance between running lines on curves and between the running lines and yard. The copper clad track is fine for flatbottom, though I will probably use a mixture of chaired bullhead and flatbottom on ply sleepers when ever I geet round to building a larger layout. Unless you want a double track tail chaser or model the present day scene the short trains and infrequent services on many lines should not be too much of an issue. I started out with plans for Kilmessan Junction on the Meath Road, made a start on Ballymoe on the Mayo Line and have long term plans build a Burma Road model based on Kiltamagh one of the more compact stations. Lovely pic John and the coaches look brilliant behind the loco. Rich, Jim Smith Wright's Birmingham New Street has to be the last word in modelling. He's the Albrecht Durer of model railways. He even modelled the phone directories in the phone box. I'm hoping to do something a little less detailed. Have you seen his video of HST tests on the storage roads for Calcutta Sidings? They're quite phenomenal. Fran, thanks for the link. That collection of layouts is going to repay some detailed study. John, sorry to hear about the problems with your track clearances. It looks like a great layout. You should really relay it: it deserves to be up and running. I'll come back to that point about operation of short trains – it's on my mind a lot as I think about layout ideas. Alan have you seen the pad locks that Jim modelled on Birmingham New Street. Jim has also produced some nice little etched parts for the Irish modeller such as hopper windows for the MK111 push pull coaches. He also produces some excellent B4 bogie steps and steps for the ends of MK1 & MK11 coaches. I took some extra photos last night, so a bit more about straight track before I move on to points. Sand the rivets. Sand the bottom of the rail. Use an alcohol cleaner on both. Allow to dry. 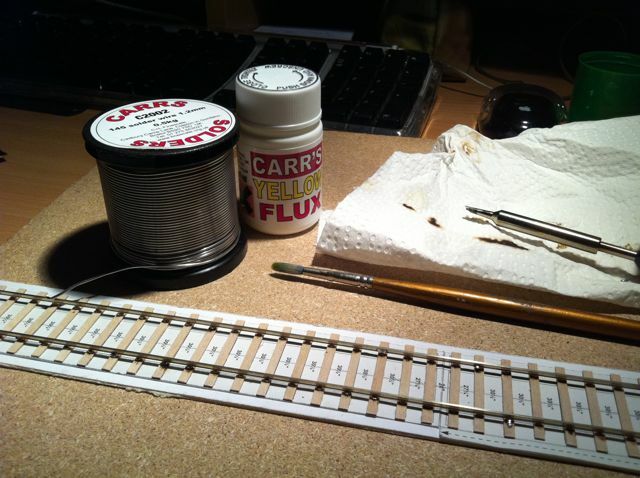 Paint the solder onto the rail and rivets with a brush. (Hold the rail with a clothes peg sized clamp at either end, to keep it upside down while you do this.) Turn the rail the right way up. Try to get it sitting on the rivets before the solder goes everywhere. Heat the iron. Apply the iron to the side of the rail at the first joint, until the solder melts. (It turns from dark grey to silver.) Take the iron away. Push the rail up against a steel straight edge to make sure there are no kinks. (Kinks: good in a 60s band; not so good on a railway.) Solder the joint at the far end of the straight edge. Solder the joint in the middle. 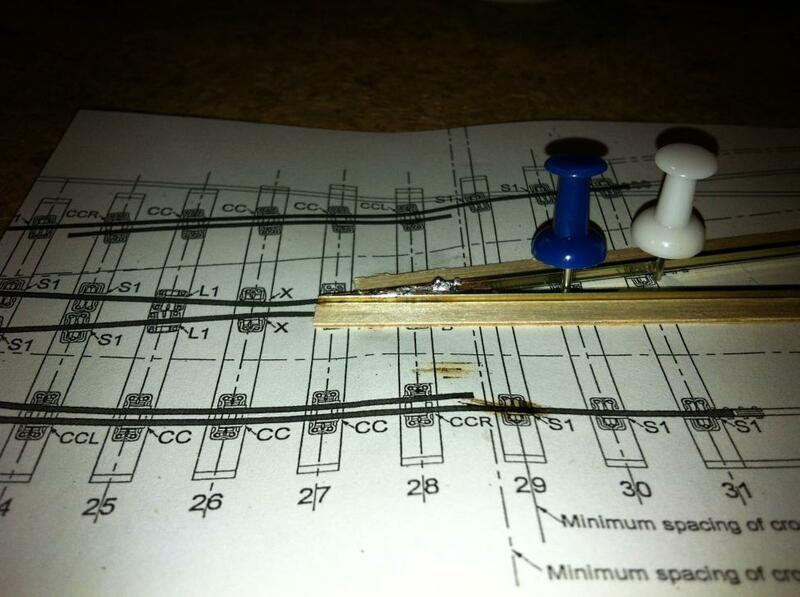 Use a pointy tool to press the rail down as you solder. Hold the tool there until the iron has been removed and the joint is solid. The rail should now be straight. Solder all the other sleepers. You now have one rock solid rail. Start the other side. 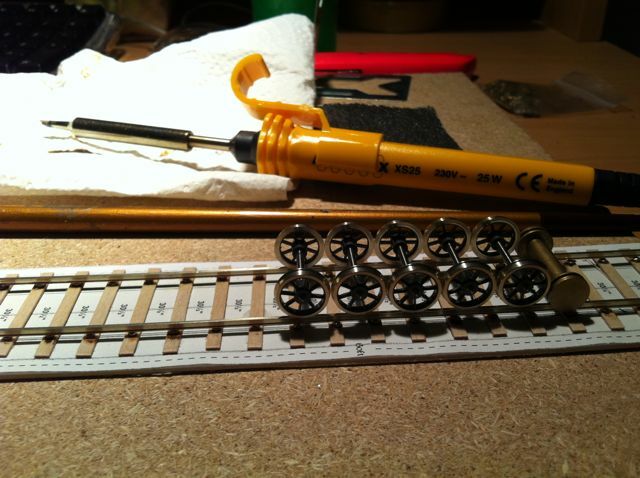 Prepare the rail and rivets the same way. Stick a track gauge either side of the first join. Solder the first join. Roll the track gauge along, about 10-15 cm. You'll come back to the sleepers in between. Track gauge either side of the joint you want to make. Solder it. Repeat until you get to the end. Second rail is now fairly gauged off the first. Go back and solder all the joints you left out. Keep using the track gauges as you go. Run a roller gauge along the full track. Does it stick anywhere? Heat a few joints and try to loosen it out. Roll a set of wheels down it. Oops. Where are they? Is that flux on the carpet? Emergency clean-up. (Don't forget to bang your head when getting out from under the desk.) Tell nobody. The result should be a nice series of neat well-soldered joints. I should have cleaned the flux off when I finished. Must develop a procedure for that: don't want to soak the plywood. See how the paper has crinkled up. Iain Rice says to stretch it and stick it down, but that then it acts like a loudspeaker. I could build it on the paper and then remove the paper before laying, but that won't work for the chaired rail, where the rail is free to slide through the chairs. I've some thoughts on how to get around it, but I'll keep them for my test plank, which I'll get to in a while. Quite a nice piece of track. Not too much solder around. Could do with a clean. The increase in rail weight and move to bullhead on some lines was driven by the increase in axleload and faster speed in the early 20th Century, also improved quality of steel meant that rails lasted a lot longer. 80lb rail cascaded out of the main line in the early 1900s might last for many years in branch line use, 90lb rail laid down by the MGWR in the 1920s lasted in service on the Westport and Sligo Lines until the 1990s, some GSWR bullhead from the early 1900 may survive in service to this day between Waterford and Bellview and onwards to Rosslare Strand. The*MGWR*main line system* had been upgraded to*85-90lb rail and bridges strengthened*to*allow**its large relatively modern*4-4-0 & 0-6-0 Classes to work through on all its principal routes. While the Meath Road to Kingscourt and Athboy looked fairly*run down*in CIE days the tri-weekly North Wall Kingscourt Goods was regulary worked by a large MGWR or GSWR 0-6-0s. 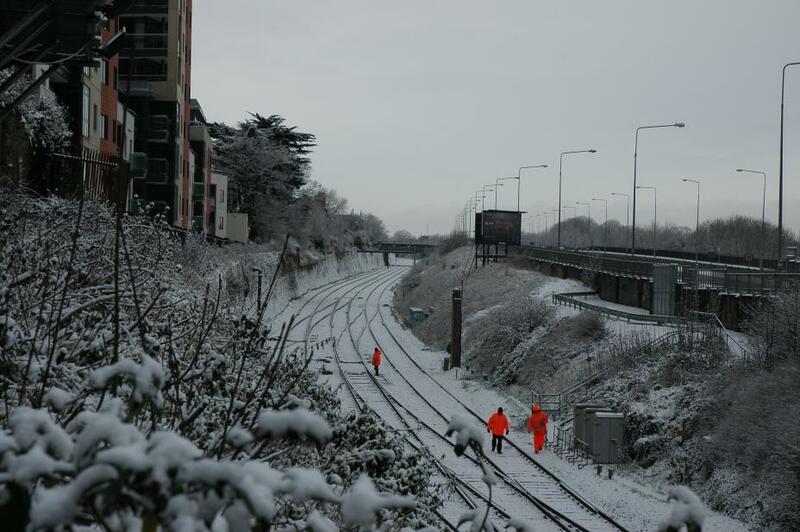 I haven't been able to get to the Waterford – Rosslare line, or even as far as the IRRS and that's less than a kilometre from the office, so any pictures anyone might have of old trackwork, showing the sleepers, would be useful. This is the C&L system, with functioning chairs, fixed to plastic sleepers with solvent. It's much easier to build than the ply and rivet. It looks better. And it lets the rail slide through the chairs, so it'll probably give a better ride quality. But the painting will be harder. 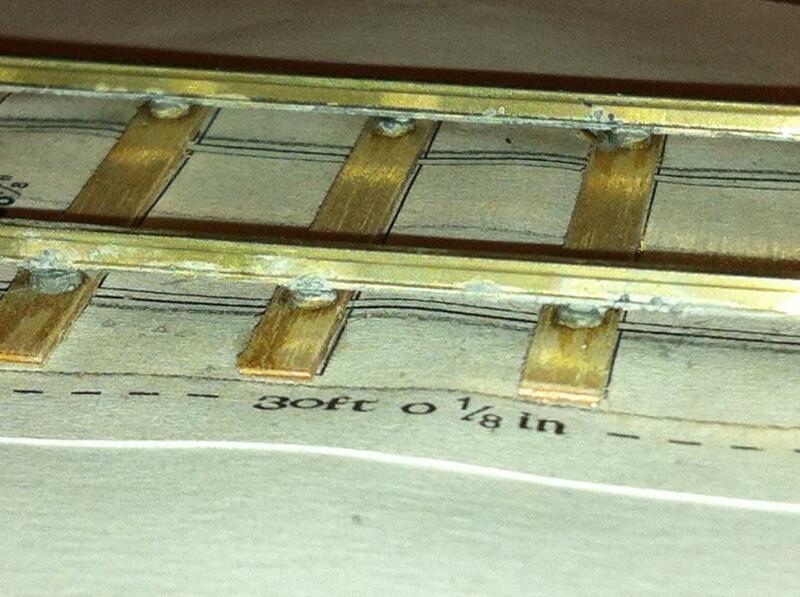 Also, you can't lay the sleepers, then ballast, then put in the track, so it's going to be a bit more awkward to use. P4 Track Company / Exactoscale do a similar product with plywood sleepers. Rich mentioned it above. That's what I'll use ultimately. But the ply and rivet is good practice for the moment, and the stronger system may be better for points. I can always use the chairs in a cosmetic way. The little wooden keys go on the outer faces of the rail, on the side of the chair the train is coming from for a double line, so the vibration from trains passing over doesn't work them loose. (For single track, pick a side: one training shaking the keys loose should be balanced by another working them back in. Employ a good ganger.) Make sure to get them all the same way. Cut them off the sprue. Separate into two groups. Thread onto the rail. Push into position. Then put the solvent on at the ends first. Use the straight edge to make sure the rail stays straight. But I never heard of a prototype issue with chair creep. Note the chair wandering off the end of its sleeper. This happens when pushing the rail down to ensure a good join. One to watch out for. Finally after all the talk over the years of 21mm track its great to see someone actually showing us how they go about building it, and taking us through a step by step guide I'm really enjoying reading this thread but I don't think I would be converted as it's a lot of work and as John Mayner said in another thread it would take for ever to build a large layout. I have to agree with you there Anto it's great to see someone building the track from the standpoint of a beginner and Alan is doing some great work. Building your own track separates the men from the boys as far as patience is concerned, it has a lot of comparisons to the type of work that you do in so far as some of the work is very intricate. Spurred on by this thread and seeing the fruits of the lads labors I mixed up a solution of my preferred stain and sloshed some sleepers into it this morning. They are still drying out and when they are dried I will upload a photo or two as that is always the way that I start the job as it's best to get that part of the build out of the way first. Building the track in situ on a pre printed template from templot is the best way to go if you are modelling a prototype. Building the track and laying it in sections like you would with Peco set track or flexible can sometimes lead to disaster and lots of headaches. 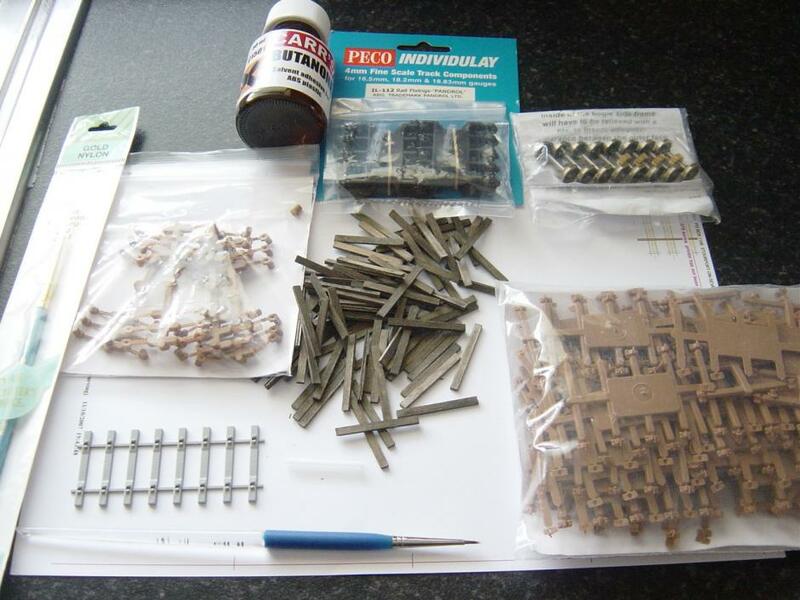 Building a model railway and a model of a railway are two completely different aspects. Both need a fair degree of planning and skill. When you are building track to 21mm S4 standards you have to get the track panels the correct size the sleeper spacings can be a bit hit and miss on the prototype so sometimes you have to incorporate that level of perfection if you want it to look right. I will be installing four bolt fishplates every 17th sleeper as they are in Clonmel Station. The sleepers where a point meets a piece of plain track and where two pieces of plain track meet can sometimes be wider than the other sleepers and that is something that you need to look at as well. I have only talked about what I am about to compose here to one member of this forum and it was in private. I had an accident many years ago and it left me with a disability. I damaged the L5 SI area of my spine. I fractured the vertebrae and tore an 18mm piece of ligament which has left me with scar tissue. I also have sciatica as a consequence and I suffer crippling muscle spasms. The accident also exacerbated an underlying degenerative bone disease which I was not aware of previously. Due to this I cannot sit for extended periods of time and my modelling time is limited. When the family and myself traveled down to Wexford this year for the show at Easter we had to make some stops along the way so I could stretch my legs, this is a common enough thing when I am traveling by car so I don't usually travel by car over long distances, I always travel by rail whenever I can as I can stretch the legs and walk up and down to loosen the muscles and other soft tissue. For my layout to be what I hope it to be I have had to photograph, measure, the complete site of the station over 3 years to compile all the information I need. I will be making my own buildings so exact measurements were required as were photos of windows and the ornate metalwork. The planning stage has been as important to me as the work to come will be. When I start building the layout it will take time, it might not ever get finished. There may be long periods of no progress being made, but I won't let the health issues get the better of me and when I can work on it I will lash into it and savor every minute of the work, well nearly all of it, the butanone can have strange effects on the mind after being near it for to long. This group is a place of learning, it has a club type atmosphere and a very friendly and easy going vibe. I have made some great friendships with people on here, and sure sometimes we may have disagreements and differing views on subjects but the real friendships are the ones that last beyond a row and thankfully all my friendships are healthy with other members bar none. We all have our own tastes and priorities regarding our modelling and we see different merits in our own way of modelling and whats good for one may not be good for the other. I really admire John Mayne's method of modelling from the first inception or spark of an idea, to the research, design, production, of the component parts, the building of the model, and final finishing of a really classy model. Johns methods include everything and in my opinion that's what makes him the best modeller on this forum. There are enough people on here that upload videos of their work or links to their work on video hosting sites. It's hard to see how you could make a video of the various stages of finescale track interesting for people to sit through it without it becoming repetitive. What I would like to see is maybe some video or footage of what Anthony or George do in the weathering process. There is a lot of the skill involved with what we as modellers do in our own field, so how about it you guys that are professional weathering experts any chance of some video footage of the weathering process. Set up a camera on a tripod and show us the out of the box model that you receive to the model that you send back to the client. I am sure that the clientèle would love to see how their model was transformed into the beautiful piece of work that you guys create. Anyway it's getting very overcast here in the not so sunny southeast this evening and the light is very poor at the moment for taking photos under natural light conditions so I will photograph the stained sleeper batch tomorrow weather and bad back permitting and try and get some shots of all the tools and other paraphernalia that I use. Rich unfortunately I am far to busy to be doing video's of how to weather a loco etc. There are plenty of free videos on the subject on You Tube or you can buy them on the likes of Ebay. That's how I learnt. Now back on subject as I'm loving Islandbridgejct's tutorial so much on how to build track that I don't want to hijack it by talking of videos. Overcast, Rich? I can't get out of my house cause of flooding! That's a shame Anto. I thought maybe a ten or fifteen minute expose of the master at work would be a big hit with the other members. It's fantastic looking at pictures of finished models or the many video's you have uploaded here or on youtube of your layout and models but I would love to see your technique. I have a friend with some high end HD camera's and he has a hell of a good editing suite we could have a golden globe or an oscar in the making. Vincent there was a coastal mist hanging over the town earlier today and it felt more like January than June. First class stuff Islandbridge you and John are certainly leading the way in 21mm and its brilliant to see the progress in pictures so keep on posting. One more instalment before the weekend. 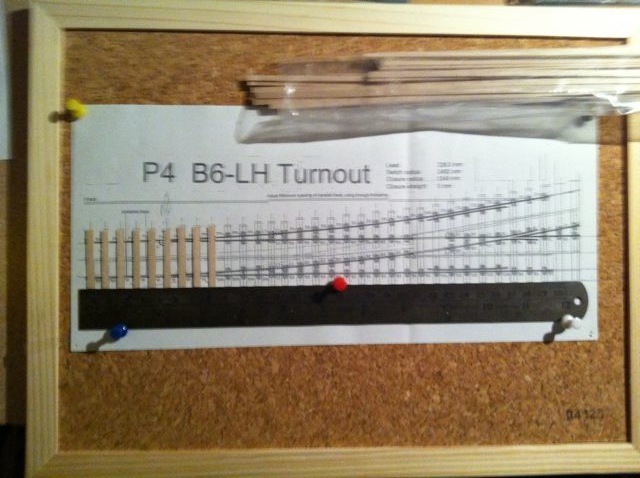 The first problem with turnouts is templates. The easy way to resolve this is to get a copy of Templot. 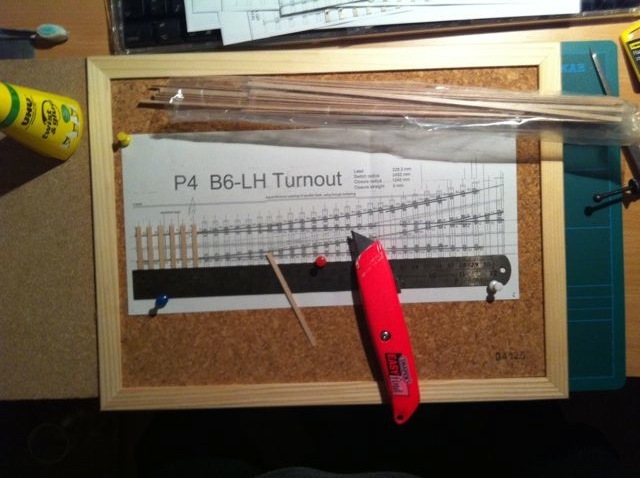 It can generate turnout printouts in 21mm gauge, and away you go. So I got the templates from the Scalefour Society Stores and wondered how to convert them to 21 mm gauge. Ultimately, it's fairly straightforward, but hard to describe. Cut it in 3. 1 part is the crossing. 1 part is the straight side. 1 part is the diverging side. 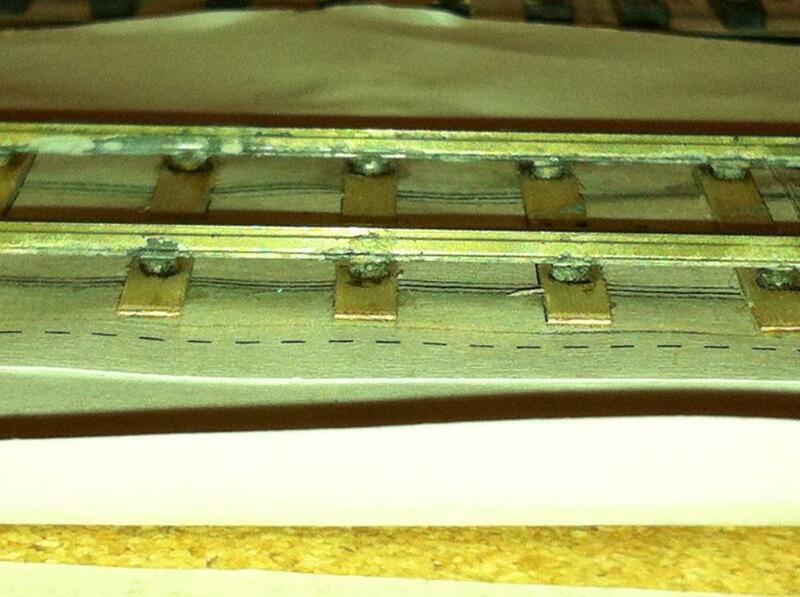 The cuts are made along the centre line as far as the joint between the wing rails and closure rails. You need to draw the centre line first. 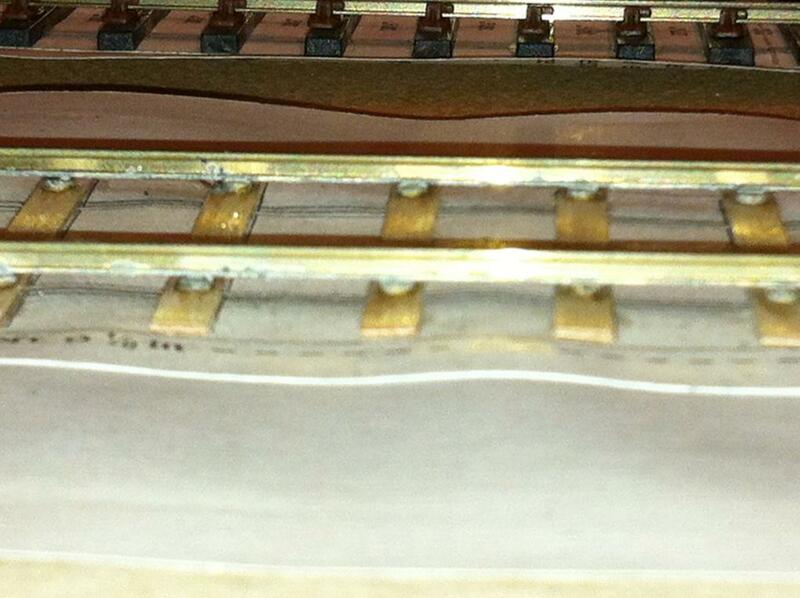 Where the closure rails come together, you need to keep the cut about mid-way between the two rails. Now the 3 parts have to be stuck back together, but slightly further apart. Get a blank sheet of paper. 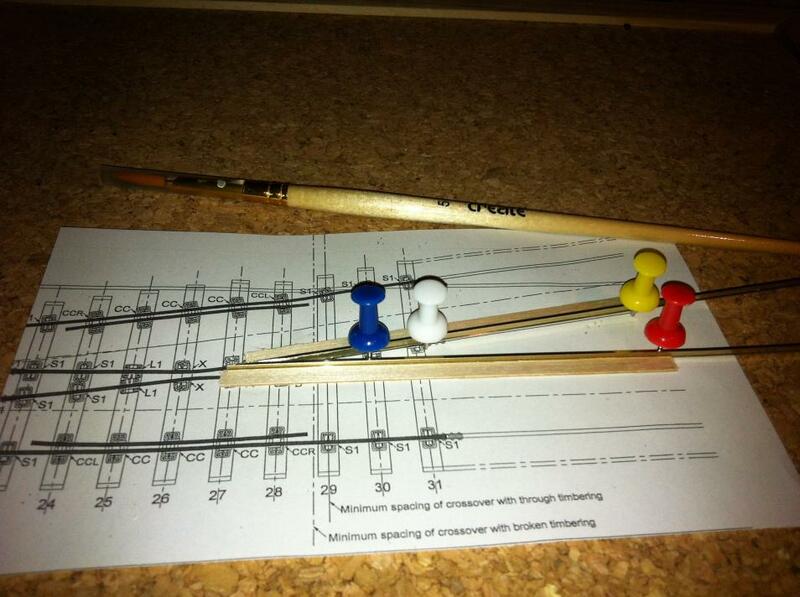 Mark out a straight track and centre line, 21mm gauge, so 10.5 mm between each line. 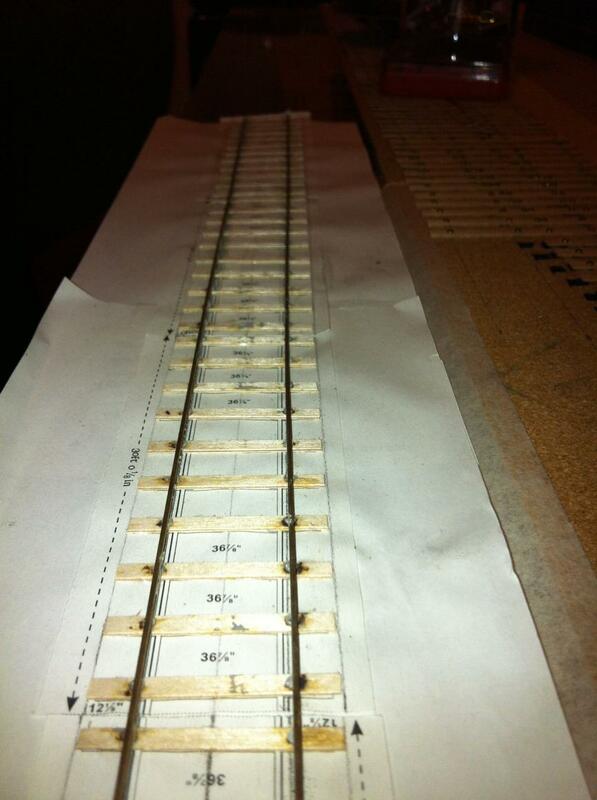 Glue the straight side template piece down, in line with one rail on the lower sheet. Place the diverging line piece loosely on the lower sheet. Place the crossing piece so that it aligns with the appropriate rail on the lower sheet. Now slide it out until the wing rails align with the closure rails. Glue it down. Mark a 21mm gauge mark for the diverging line, measuring from the splice rail on the crossing section. Now make sure both ends of the diverging track section and the closure rail on that section all line up with the rails they connect to. Draw in the missing sleepers. I was lucky: a B6 turnout works with exactly 2 extra sleepers in it. The check rails end up out of position and have to be moved. You can do this now or do like I did and wait until you're half way through building your first turnout to find out. Anyway, there it is: one template. Note the cut between sleepers 22 and 23. Sleepers 23 and up in the crossing unit have been moved outwards so that they line up with sleepers 25 and up in the outer units. I've filled in the missing sleepers and tracks in the gap near the crossing, and I've extended the outer units for a further 2 sleepers. This is all a bit rough and ready, but it seems to work. (If anyone wants to tell me why it's wrong, that'd be great.) Notice that the check rails got left behind, causing problems later. If this sounds like too much work, it is. It took me about 2 weeks to figure out what to do, and the result is only OK. Next time: just get Templot. Alternatively, Exactoscale said I should contact Len who might be able to sort me out. Before I go on to the actual building, I'd point out that a B6 turnout is 320mm long. 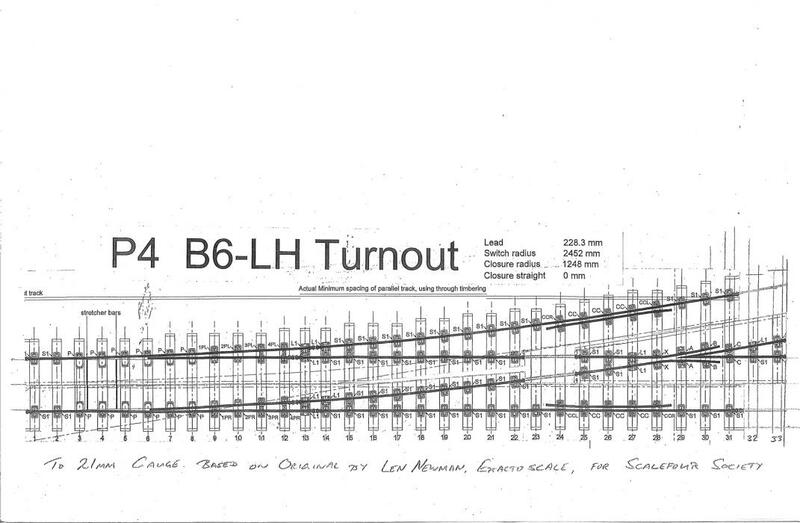 That's a lot bigger than a large radius Peco turnout; and B6 is really the minimum for main line use. A “C” or “D” turnout will be even longer. 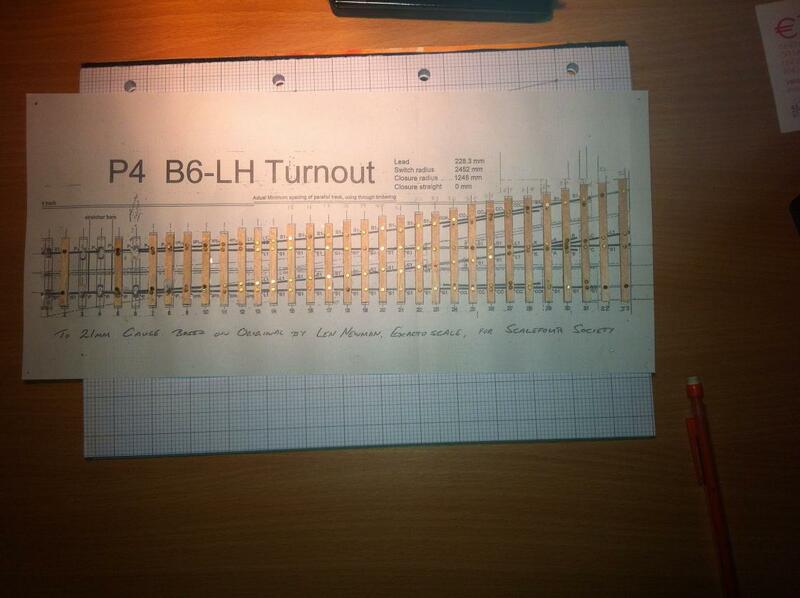 This is the real issue with size in P4 or EM – the turnouts are huge, which means you get a lot less layout into the same space. You may compromise by running short trains: 4 six wheelers or an equivalent length of wagons, or a nice little mixed train. And that's before you start to think about the curves. Minimum radius is over 3 feet for six coupled engines, and you really need more if you can manage it. Overall, even with discussion of small prototypes, finescale track needs length. But it looks superb so it's worth it. To be more accurate. I think it's worth it; but I can well see why someone else wouldn't. It took several weeks screwing up my courage before I could move on to building the things. When I did, it wasn't nearly as bad as expected. Difficulties are: the common crossing (“vee” or “frog”), the point blades, the wing rails, and the check rails, in that order. Sleeper timbers are 12” wide. Normal timbers are 10”. The Scalefour Stores sell both. Amazingly, you can actually see the difference. Next the crossing. This is the hard bit. File it like they say in the P4 Digest. Then assemble. I built a temporary jig as shown: 2 bits of sleeper timbering set at 1:6, glued to a part of a template. Pins to hold the rail up against the wood. A cork board underneath to hold the pins. File and check. File and check. 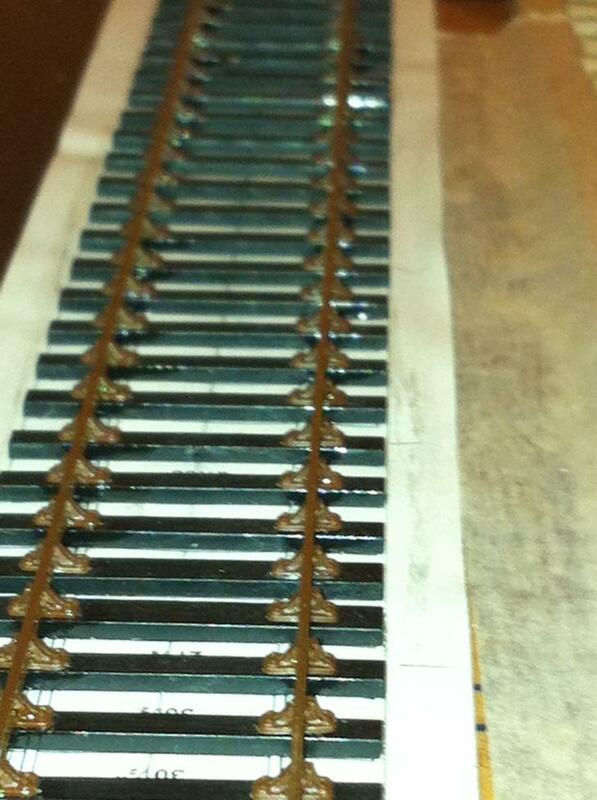 When the 2 rails fit together right, flux and solder. Next time: do it upside down. That way there won't be so much solder on the top of the rails needing to be filed off. Obviously, there's more to come, but it takes a while to write it down. More next week, hopefully. I would have to agree with you that John Mayner and Islandbridgejct are the best 2 modellers that I have seen in this field of building Irish track keep up the good work guys you are streets ahead of everyone else. You obviously haven't seen the great work that Tony Miles has done on Adavoyle Anto. Loughrea is another masterpiece in track building also. I spent the other day staining some sleepers as I have some free time this weekend I thought I would build some track panels of different variety. I will use bullhead and flat bottom rail on wooden and concrete sleepers. This gives an idea of what is needed in the tool kit to get started. Here is a sample of stained sleepers (I stained 300 plain sleepers not all of them are in the picture) some concrete track panels, pandrol clips, 4 bolt chairs, fishplates, butanone a nice number 3 paint brush for applying the butanone, and some wheelsets. The great work that the lads are doing has me inspired to get cracking and dust off the cob webs. I will upload photos as I progress. Gareth would having a crack at building some track appeal to you. I would be delighted to offer you some of the ingredients and post them to you. Or if you are ever down this neck of the woods you would be more than welcome to come to my home and have a chat and some grub and build some track. I will make the same offer to you Anto that I have made to Gareth regarding sending a few bits and pieces in the post to have a crack at if you would be interested as it's always nice to add another string to your bow. If you are ever down this way I'd love to have you round for a visit and some grub. You could bring the family and we can let them head down to the amusements with my missus and kids, and bring your airbrush. Anyone can do it Anto the time and the patience are the biggest factors involved,there are so many different products available from the trade that make it so much easier. There used to be a lot of snobbery involved in finescale track building that has thankfully been eradicated from the hobby through groups like this. you don't have to necessarily build your track to 21mm standards as it can be built to 16.5 as well. Let me know when you have time as I am sure it is a premium for you at the moment. I thought a nice piece of bullhead rail might be nice for you to display your work on as it is very common on the network but not available from Peco. If you are to busy I will build a panel for you and we'll sort something out with getting it to Casa Anto. And this is what we call summer!